With the watermelon and ketchup/mustard/relish displays popping up in the supermarket, it must be summer. And that means time to barbecue some meat, right? Nope. Because as many of you know, barbecue is a noun. Let us proclaim it from atop Mount Sinai. If you’re looking for a verb to communicate cooking burgers and dogs, etc., we suggest ‘grilling.’ Or even ‘cooking out’ or having a cook out. As I reformed barbecuer, I can see both sides of this divide. And what I see is the folly of using barbecue as a verb. 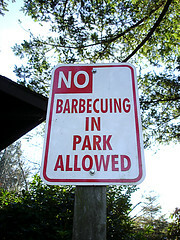 If you insist on saying you’re having a barbecue, we’ll look the other way on this incorrect usage. 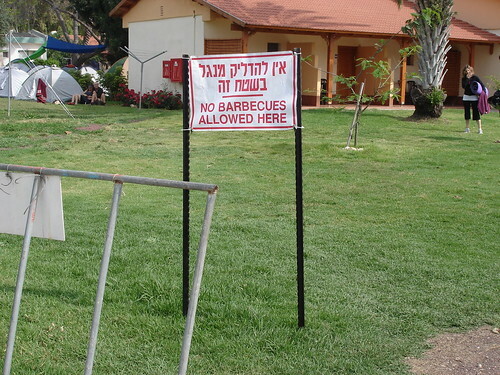 But please, oh please, just don’t say you’re barbecuing anything. On a mostly-unrelated tangent, I wholeheartedly agree with this sentiment. But the photo below rocked me to the core. Now if you’ll excuse me, I’m off to do some serious soul-searching.